Thursday, 21 April, 2011. 09:20. 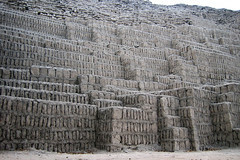 Lima. Well, we’ve had our bad news for today. We have put our dirty clothes together ready to be washed by the hotel laundry service, only to be told that today and tomorrow are holidays (being Holy Thursday and Good Friday), and the earliest they will do it is Saturday – the day we leave Lima! We’ve had an interesting day exploring Lima on our own before our tour starts tomorrow. We began by trying to get our laundry done by the hotel and failing, so we had breakfast in the hotel restaurant. It was a simple continental style affair, with bread, ham, cheese, and fruit, although a bit of asking about an empty spot on the buffet labelled “cereal” produced two bowls of corn flakes. It also turned out you could order eggs for extra cost, but we didn’t bother. M. liked the peach yoghurt on the corn flakes. After eating, we grabbed our laundry form the room and went to go for a walk to see if we could find an open laundry. I’d seen three of them within a few blocks of our hotel yesterday, so knew we’d find some – the only question was whether they’d be open and able to do our wash before closing for Good Friday. By amazing good fortune, we ran into a guy from Intrepid who was looking for us in the hotel lobby. His name was Edwin and he had information for us about tomorrow’s tour, which would be led by a woman named Alejandrina. He also said he was here to help us with anything else we needed and said, “I see you have laundry!” I explained the hotel wasn’t accepting it today because of the Easter holidays and he said there were a couple of laundries nearby that were good and inexpensive, and gave us directions. He asked us what our plans for the day were and we said we wanted to see the Museo do Oro. Edwin said he’d arrange for a trusted taxi to meet us at the hotel in 20 minutes after we’d dropped off our laundry and the fare would be 35 soles. I asked about returning and he said to just ask the driver to wait for us – he would wait an hour for 30 soles. I said we might spend 3 or 4 hours at the museum, and Edwin gave me his mobile number and said to call him about 30 minutes before we wanted to leave and he’d arrange another taxi to come and get us. This was great, as it meant we didn’t have to negotiate a fare with an unknown taxi driver in Spanish, or worry about getting an untrustworthy one. Edwin confirmed we were from Australia, then said maybe one in ten drivers were “dodgy” – using a good old Australian slang word, which made us smile. We walked two blocks to the first laundry and found it open. A helpful woman customer translated for us to confirm that it would be open tomorrow and we arranged a bag wash for our clothes to be picked up then. Paid for by weight, it came to 17.20 soles, which was an absolute bargain compared to the US$71.30 – or about 210 soles – the hotel would have charged. So all up we ended up saving about $65! We pick up the clean clothes tomorrow after 13:00, right before we meet with our Intrepid tour leader, so even the timing worked out well! Back at the hotel, our taxi driver was waiting for us. 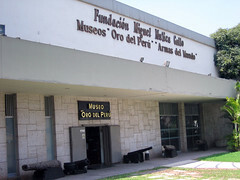 After a quick trip to our room to pick up my camera, we left for the Museo do Oro – the Museum of Gold – which contains many precious artefacts form the pre-Columbian cultures of the region. This was about 25 minutes drive away, through somewhat grimy streets under the seemingly ever-present mist that hangs over Lima. We got to the museum at 10:25 and a sign at the closed gate said it opened at 10:30. We paid the driver 35 soles and he asked if he should wait for us. We said no, and he looked worried and said in Spanish we should call Edwin when we wanted to return. We assured him we already had the number, which satisfied him and he left. Entering the museum property, we passed a series of about a dozen souvenir shops, some junky, but also a couple of high class jewellery shops and a high fashion clothing shop. Past there was a two-storey block-like building which housed not only the Museum of Gold but also the Museum of World Weaponry – entrance to both was included on our tickets. We began with the ground floor, which was the weaponry. This was an amazing and extensive collection of weapons and armour from the late Middle Ages, through the early days of guns, to weapons as modern as World War II. The early stuff included European plate armour, swords, morning stars, pole arms, and so forth, plus Japanese samurai gear, armour, katanas, bows and arrows, as well as some Arabic weapons, Malaysian and Filipino weapons, and Chinese weapons. There was a large collection of daggers of all cultures too. Next came guns. Lots and lots of guns – from late medieval through Spanish and English colonial, American Civil War, lots of Latin American independence era guns, American Wild West, World War I, and World War II. There were a lot of Nazi items as well. With all these weapons were also uniforms, medals, helmets, and other associated paraphernalia. A lot of the items naturally were from Peru, including personal weapons owned by various presidents of Peru. One of the major items was a pistol owned by Napoleon Bonaparte – complete with his distinctive “N” monogram inlaid in silver on the wooden handle. We covered most of the weapons and then popped outside for a break to get a bottle of water and sit in the breeze for a minute, since the building was warm inside and seemed to be cooled only by fans, which I thought was unusual for a museum containing so many valuable old pieces. You’d expect it to be kept climate controlled. It also seemed rather dusty and a bit run down, though the collections of items were spectacular. The upper floor of the building was restricted access – probably offices or something. The gold museum stuff was downstairs in the basement. As soon as we descended the stairs, we noticed things were very different. Two security guards (we’d seen none upstairs) flanked two heavy and modern bank vault style doors that opened into glass doors. Through these we entered the cool of air conditioning and a series of rooms equipped with modern glass display cases, about 30 or 40 years newer than the ones upstairs. This area contained all the pre-Columbian artefacts. The first room we entered had flaked stone spears and arrowheads, stone axes and clubs, and wooden swords – weapons of the Inca, Nazca, Moche, Chincay, and other cultures of the Peru region. They had no ability to smelt anything harder than copper or silver, so the weaponry was mostly stone and wood. Next we came to copper implements, tools, weapons, and ornaments. The verdigrised copper came in all shapes and forms, mostly ornamental or implements with decorations. Then came pottery, with jugs, bowls, and so on made of clay, with various designs showing people and animals in various shades of brown glaze. A lot of the jugs and vessels were in the shape of animals or people. Another few rooms were full of silver – tons of it, probably literally. Much of it was pre-Columbian jewellery and ornamentation, but there was a wide selection of Spanish colonial silver products as well, including many Christian icons. Another room had textiles and cloth-making tools. Then there was a room containing about seven or eight Inca mummies – a few in the crouched position used for noble burials, a couple lying outstretched like the commoners. There were also several skulls, some showing trepanation wounds, and some severed and mummified heads – cut off as enemy trophies and strung with cord to be hung up. Finally, we came to the gold. Again, there was probably literally tons of it. Much was in the form of gold discs of various sizes, from coin sized up to large circles maybe 40 cm across. There were also several large and impressive death masks and some tunics covered with sewn-on gold scales. There were gold crowns, armbands, nose rings, earrings, tweezers, drinking vessels, bowls, figurines, knives, and much much more. The prize piece was an intricate tumi – or ceremonial knife – a mezzaluna-style curve blade of gold topped by a humanoid figure of gold, decorated with turquoise inlay. The piece was about 30 cm high and simply amazing. The entire display, even just in one of the two gold rooms, was staggering. No wonder it was in a modern basement secured behind bank vault doors. By the time we were done it was 14:00 and we were getting hungry for lunch, even after having some chocolate coated nuts from the gift shop as a snack. I phoned Edwin to arrange a taxi to pick us up at 14:30, while M. browsed the other souvenir shops in the compound outside the main museum building. 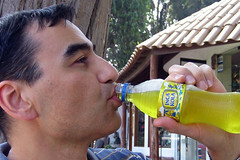 We ended up buying an Inca Kola T-shirt for me, with which the lady gave me a free bottle of the famous drink. I noticed it had caffeine in it, but had a few sips to try it – sweet and citrusy – before I poured the rest down a sink in the toilets. If it hadn’t had caffeine in it, I would gladly have drunk it all in the heat. Our taxi arrived and took us back to the hotel – a different driver this time. We popped up to drop my camera off – I hadn’t used it at all because the museum forbade photography – then we went for a walk to get lunch. 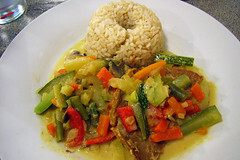 We found a vegetarian restaurant not far from the hotel, El Paraiso Bio Leben on Alcanfores. It was a very understated place, with a small selection of dishes. 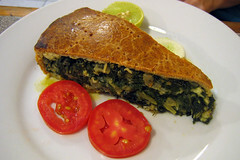 I chose a rice dish with vegetables and a meat-substitute, while M. had a slice of spinach pie. We also got some sort of herbal tea for free with our meals. It was simple food, but filling and tasty. After eating, we walked back to the artisan market we’d visited yesterday, where M. wanted to buy another of the knitted scarf things she’d bought as a gift for herself. 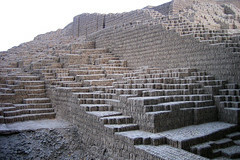 That done, we continued walking along Avenue Jose Larco and then down a side street to the intriguing hill marked on our map as the “place of interest” called Huaca Pucllana. I guessed this was just a park perhaps, with a hill you could climb to get a view of the city. But when we got there, it turned out to be an ugly mound of dirt with a concrete fence around it. The mound was about 10 metres high and too steep to climb, if you could even get near it, which the fence prevented. Puzzled, we walked along the fence a bit, then realised that the mound had a curiously regular pattern showing in places. I suddenly realised that much of it appeared to be ancient brickwork! 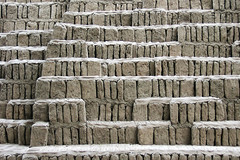 Walking further around confirmed this as more details of the bricks emerged from the covering layers of random dirt. By the time we’d walked a quarter of the way around the mound, there were steps, terraces, and platforms visible – clearly this was some form of ancient building site. This was a pre-Columbian archaeological ruin, in the middle of the city, indeed surrounded on all sides by suburban streets and middle class houses! We did a full circuit of the ruins, taking photos through the fence with M.’s camera. Near the end of our circuit we found the entrance – closed for the day – with a sign indicating entry was 10 soles for adults, 3 soles for university professors, and 1 sole for seniors and children. The property also seemed to have a small section with a display garden of native plants and a pen with some alpacas in it. That done, we walked back to our hotel intending to rest up a bit before dinner. 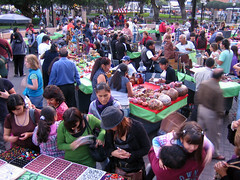 But at Parque Kennedy we stumbled across a small market of artists and stalls selling various knick-knacks, bags, and jewellery. First we went into the large church by the park to have a look at its interior (it had been closed yesterday). A service had just finished and it took us several minutes to get in past the throngs leaving. It was okay inside, architecturally nice but nothing special. Then we browsed the market for a bit, which took us to a bit after 18:00. 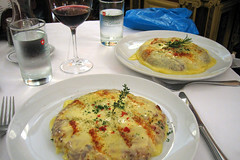 We decided this was late enough for an early dinner, so skipped returning to the hotel and went straight to the nearby La Tiendecita Blanca – The Little White Shop – which is of all things a Swiss restaurant. We both had the rösti for dinner, with cheese and a hint of chili on top, mine with bacon in it. It was good. I also had a glass of red wine, which was very nice, fruity and low in tannin. I think it was probably the Argentinean malbec advertised as the wine of the month on the card on the table. 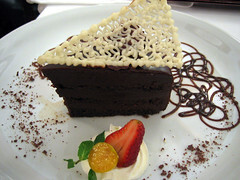 After the meal, I had a slice of decadent chocolate truffle cake and M. had a mocha. Full of this good food, we headed back to turn in for the night, stopping along the way to buy some toothpaste and moisturiser cream from the supermarket. All up, an enjoyable and somewhat relaxing day. Just what we needed after the hectic and sleepless cruise in the Galapagos. This entry was posted on Tuesday, 18 October, 2011 at 17:41	and is filed under Diary. You can follow any responses to this entry through the RSS 2.0 feed. You can skip to the end and leave a response. Pinging is currently not allowed.